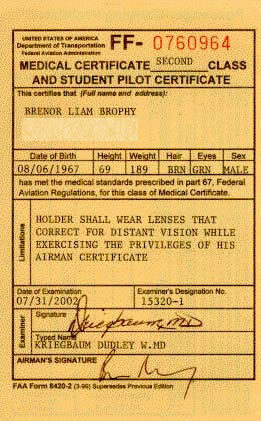 I got my medical certificate second class and student pilot certificate at lunch time today. I was a little nervous going to see the doctor, who knows what he would find. But in the event it was a breeze. A urine sample (I guess to check for diabetes), eyesight check with and without my glasses, peripheral vision check using a coat hanger that he waved behind my ears, a hearing check which was simply repeating numbers he said while standing behind me, standing on one leg with my eyes closed and then listening to my heart and lungs and a final blood pressure check. 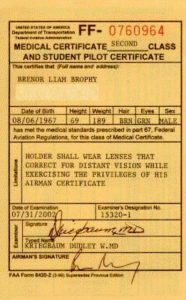 All that and $80 and I got a little yellow card that is my certificate to learn to fly. Tonight I installed and started the Cessna Pilot Center (CPC) software. I was very pleasantly surprised at how good these classes were. Basically, there is a flow chart that has every step from the very beginning to the final check ride. It alternates between classes you complete at home and actual flying lessons. The classes are basically watching video presentations then answering different questions on the material, usually some twist on multiple choice. If you get an answer wrong it takes you right back to watch the section of the video again that deals with that topic. It tracks your progress and you save this on a floppy disk that comes with the kit. The sections on the actual flying lessons tell exactly what the flight will cover, what you should know after you done and then does a preview video of the actual flight. I completed the first two lessons and the first flight which just about brings me up to date ready for tomorrows flight. I also got in some practice with the new rudder peddles for FS2002 and made some progress – the simulator is good but the speed on the ground is much harder to control than in the real plane. I picked up the Cessna Pilot Center kit from Tradewinds ($299 for a bunch of CDROMs and some books including my shinny new pilots log book). This kit will be the ground school part of my training. Then I stopped by Fry’s Electronics and shelled out $130 on a set of rudder peddles for FS2002 – I will practice swimming a plane up a taxi-way in the privacy of my own home until I swim no longer. Next lesson is booked for Thursday at 6pm. My second flight and my first “real” lesson. Again the weather was great, wind was blowing from the North like it usually does in the evening, sunny, warm with just a little haze. I arrived just before 6pm and Grainne was waiting for me. She gave me (I’ll pay later I’m sure) a checklist card and it was out to a different Cessna 172. This time I did all the pre-flight checks from the card. It turned out that the plane only showed quarter full on each fuel tank. Grainne is paranoid about fuel so we called for the nice tanker guy again (he had gone home) and Grainne went to see if another plane was available (it wasn’t) so we actually measured it and both were actually half full. Grainne decided that this was enough for a 1 hour flight with the required reserve. I got covered in oil checking the dip-stick which requires a feat of gymnastics worthy of the Chinese Olympic team. With everything good on the outside we got inside and did another couple of checklists. I actually started the engine, we did the pre-taxi checklist, listened to ATIS (I listened, Grainne actually heard something useful). Then we pulled out of the parking space and I got to do my fish impression with the nose wheel all over again (even worse than the first time). Finally at the end of the runway we did the run-up checklist. Grainne taxied over to in between 30L and 30R and we watched two Cessna’s land either side of us at almost the same time. Then it was onto 30L and take-off. Grainne gave me the plane just a little after leaving the ground and told me to do 90 degree left turn. She then proceed to explain that highway 101 marked the boundary of Class C airspace for San Jose airport. We had a great view of the highway because we were flying right at it. I figured I should make another left turn without being told before we crossed. We climbed on up to about 4500’. It was supposed to be 4000’ but Grainne was explaining why I had to keep my foot on the right rudder when we were at full power and by the time I looked at the altimeter again we were on our way past 4200‘. We leveled off and did some shallow turns – this time the auto-rudder feature didn’t work and I had to push the damn things myself. I discovered that pushing the left rudder way to much while making a left turn puts the plane into rather an alarming nose down position. Grainne calmly told me a little less left rudder (I took my foot right off it) and things returned to a more normal attitude. More turns and I learned I could almost ignore the rudder in shallow turns (to my relief). This time I have resolved not to spend too much time looking at the instruments and tried to immitate Grainne scanning all over the sky looking for traffic (other airplanes), I even saw one before her but I don’t think it counts because it was about 3000’ lower than us on my side of the plane. We did another descent and a few more turns some climbing and some descending. Then it was time to head back to the airport. This time we had a stright in approach to 30L. We left it a little late to start descending (I knew this from FS2002, because the VASI was white-white and we came in very steep). I also screwed up the flaps, the first plane I flew in had a notch that stopped the flap switch at 10 degrees, you had to push it sideways to go beyond 10. This is a safety so you don’t put the flaps down too far while flying too fast and damage them. I was lazy, I assumed the notch was there and just pressed the lever. There was no notch and it went all the way down to 40 degrees. Grainne jumped to push it back to 10. I learned a good lesson about not assuming things, just concentrate and do it right. Grainne took over at about 1000’ and made a really nice landing (I thought), we even got to hear the stall horn just as we touched down (the best place to hear it I believe). I got to embarss myself again trying to taxi back to the parking spot, but slightly better than the last attempt. The weather was beautiful (as usual for the Bay Area in July), clear, sunny and warm. I arrived 30 minutes early (eager to do it, afraid I wouldn’t be able to find the school). My instructor turned out to be a girl from Co. Mayo in Ireland called Grainne Gilvarry (which was a surprise as I am also from Ireland, small world, my brother lives in Mayo). We spent about 15minutes looking at a map of California that showed all the airports with the various types of airspace (Class B, C, D etc) and talking about flying South of the airport to try some simple stuff. Then it was out to the tarmac to a rather worn looking small plane (which I now know is a Cessna 172). Grainne walked me through the preflight checks which to my regret was not just kicking the tires. We got some fuel from the nice tanker guy and then got ready to go. At this point I was actually sitting in the pilots seat in this dinky little airplane trying not to touch anything. Grainne was starting the engine and listing to someone called ATIS. Then before I knew it we were on the end of the runway (13R I know from FS2002) and we were off. Before we were very far into the air (it seemed to me) Grainne says “your airplane” and I actually started to fly the thing (badly). The air was bumpy and it seemed that the plane wanted to go anywhere but smoothly upwards (like in FS2002). I managed to keep it flying more or less in the right direction (I think because I stopped moving the yoke). And then things calmed down because we got a little higher. We flew south a few miles to over Morgan Hill and did a few simple turns, which felt much more like the simulator. A couple of 360’s, a descent, a climbing turn then headed back towards Reid-Hillview. Grainne, told me to just aim the plane at Lake Cunningham which is just East of the airport. A couple of miles away we started to descend again and then Grainne took over as we flew over the lake. We watched for the runway to move to 45° behind my left shoulder, turned left, turned left again and as if by magic the runway was right in front of us. We landed and taxied off the end of 13L at which point Grainne asked me to steer the plane with my feet. I think she had been secretly working the rudder when I was flying because I sure wasn’t – FS2002 has an auto-rudder feature, real planes have a flight instructor. Now, rudder peddles work exactly the opposite way you expect them to. Imagine the front wheel has handle bars and you rest one foot on each side and steer – this is the way it doesn’t work, its opposite. It is stupidly simple (press the left peddle to go left, right for right, duh!) and completely non-intuitive. Needless to say I did a great impression of a fish swimming upstream, weaving from side to side up the taxi way. We (finally) got to our parking space and parked the plane and locked it up. My first flight for real – what a rush, wait wasn’t I supposed to look outside the windows. Mostly I remember being glued to the instruments. Next time I’ll look outside more.